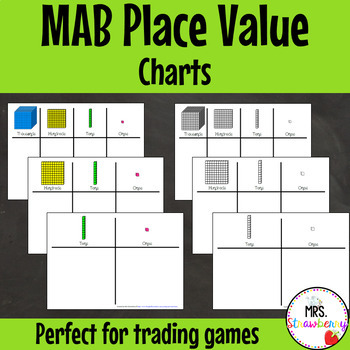 This product contains 6 place value boards that have MAB clip art to show students where to place their MABs. - Black and white boards (tens & ones; hundreds, tens & ones; and thousands, hundreds, tens & ones). These look fantastic printed on bright coloured A3 card! - Coloured boards (tens & ones; hundreds, tens & ones; and thousands, hundreds, tens & ones). ** This product may be printed and photocopied by the original purchaser only and may not be shared, copied or distributed in any way. Please respect the copyright of my products by directing your colleagues to my store. Multiple licences must be purchased if you wish to use this resource with other teachers. Thankyou for visiting Mrs Strawberry!